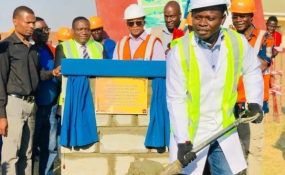 Prophet Shepherd Bushiri lays a foundation stone for the construction of the multi-million dollar Enlightened Christian Gathering church complex in Malawi's capital Lilongwe. Renowned preacher and philanthropist Prophet Shepherd Bushiri on Thursday laid a foundation stone for the construction of the multi-million US dollar Enlightened Christian Gathering (ECG) church complex in Malawi's capital Lilongwe. The church complex situated in Area7 of the Lilongwe, is said to be Malawi's biggest religious cathedral. ECG publicist Ephraim Nyondo told media that the complex wants to put to rest media speculation that Prophet Bushiri doesn't want to put up a station in Malawi where he can be operating from. On the ceremony when asked why after so many years he never built a church only to start now, prophet Shepherd Bushiri laughed out the question and said: "the church that God sent us to build is not a building. It is to help the poor, feed the hungry and be there for the less privileged and that's the church I was busy building". He added: "I told myself to help the poor first then will build the church for our ministry and then my personal house thereafter. The money I have used to help the poor was worth to help building but my calling was for the poor first."